Melt butter or oil over low heat. Plug in waffle iron. In a medium size bowl, combine sourdough starter, eggs, sweetener if using, salt and vanilla extract. Whisk until well blended. Add in melted butter or coconut oil and whisk until incorporated. When waffle maker is hot and ready to use, add in the baking soda. Mix well but don’t over mix. Batter will puff and become pillowy. Start making waffles according to your machine’s instructions. Serve with lots of butter, raw whipped cream or coconut cream, berries and real maple syrup! 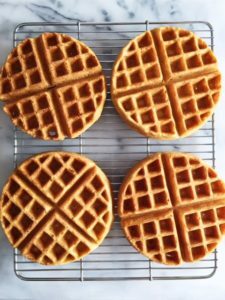 These waffles freeze very well, just toast and you are ready to go!